Turkish armed forces seized the rule of the country completely with the aim of reinstalling the constitutional order, democracy, human rights and freedoms, to make rule of law pervade again, to re-establish the ruined public order. the statement quoted by DHA said. All the international agreements and promises are valid. We hope our good relations with all global countries goes on. Yildrim says the military has attempted to launch a coup, but that the elected government is still in power. A witness in Ankara — Turkey's capital — reports hearing gunshots and seeing military jets and helicopters flying overhead. Witnesses in Istanbul also saw helicopters, according to Reuters. Istanbul's two bridges, which connect the city's Asian side to its European side, are also reportedly closed. The Guardian obtains reports that the U.N. emailed its staff to say that a coup attempt was underway. The military releases its statement to announce that it had taken over the country. 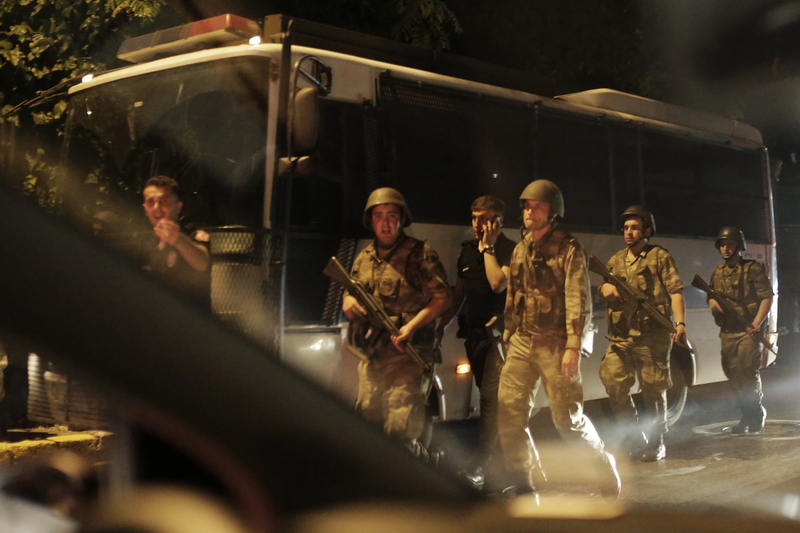 The head of the AKP, Turkey's ruling party, tells ITV that soldiers have asked them to leave. An announcer on TRT, the Turkish state broadcaster, says that the country is now run by a "peace council" that will ensure the safety and freedom of the Turkish population regardless of religion, race, and language. The current government, meanwhile, maintains that it is still in charge. Restaurants and shops are closing, something is happening on Taksim Square and Tarlabashi Boulevard seems to be closed. Cars are honking their horns and driving on the wrong side of the road. A lot of people are walking from the direction of Taksim. There is a sense of agitation, with people checking their phones or listening to the radio. Yildirim says that "everything will be done" — including bloodshed — to protect power, and that "we will not tolerate any acts against democracy." The country's prime minister also says that some important buildings are under siege but asked people to stay calm. The U.K., France, and Russia advise their citizens in Turkey to stay safe and avoid public places. Turkey's state broadcaster, TRT, goes off the air. Access to Facebook, Twitter, and YouTube is restricted in Turkey. Turkish President Recep Tayyip Erdogan remotely addresses the Turkish population from a location reportedly outside the country. He speaks to CNN Türk via FaceTime. Erdogan tells everyone, "I am president," and links the coup to exiled imam Fethullah Gülen by saying that "this country can't be managed from Pennsylvania." Erdogan calls on the public to take to the streets and occupy public squares and airports in response to the coup. Agence France Presse reports that a "strong explosion" has been heard in Ankara, Turkey's capital. A video shows a military tank on the streets, with armed military personnel on patrol. Witness tells Reuters that gunfire is heard at an airport in Istanbul. Tanks reportedly open fire around the Turkish Parliament building, according to another witness. Meanwhile, U.N. Secretary General Ban-Ki Moon is working to "clarify the situation on the ground and appeals for calm," according to U.N. Spokesman Farhan Haq. The U.S. State Department issues an emergency message for U.S. citizens in Turkey. Professor Omer Taspinar of the Brookings Institution recently warned of a potential military coup in Turkey. Speaking to the Guardian, Taspinar addresses the role of the Turkish military command in the coup, as well as what the consequences of the coup might be. The situation is really fluid. Right now the question is whether the attempted coup is from the top command, with the top brass involved, or a colonel-level or officer-coup, from a certain segment of the army. There are indications right now that it is the latter. The chief of staff of the military has not spoken yet and traditionally with Turkish coups you would expect the head of the military to be on TV taking command. This will rattle the Turkish markets. It will tarnish the country’s image. My analysis is that this will certainly be embarrassing for the country’s recently re-elected president, Recep Erdogan. The signs are chaotic right now but I think the rumors of Erdogan’s demise would be highly exaggerated given he has been on TV. A video posted to Twitter shows people in Istanbul chanting and yelling as a military tank rolls over a car in the street. Yildirim calls the attempted a coup a "terrorist attack," referring to those responsible for it as "traitors." The prime minister also says that Turkish military leadership has ordered soldiers to return to their bases. The commander of the Turkish army's special forces reportedly tells Reuters that "armed forces do not condone these actions." Reports have surfaced that a bomb was reportedly thrown at the parliament in Ankara. However, the AP reported that the coup effort has been "repelled."